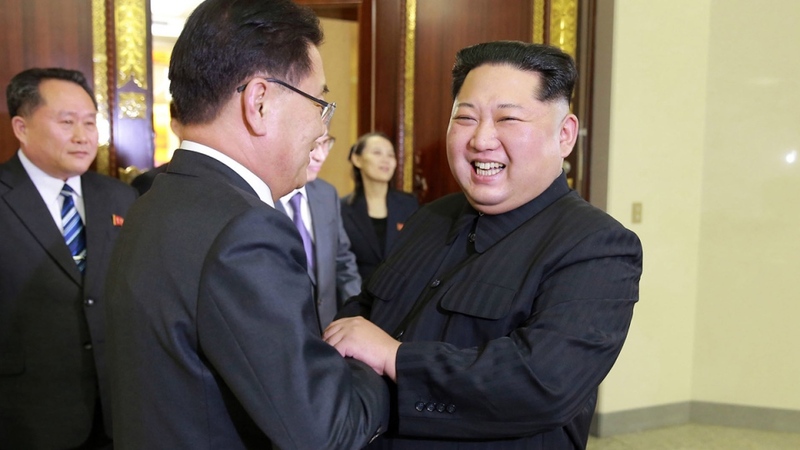 SEOUL, Korea, Republic Of -- North Korean leader Kim Jong Un grins, just on the verge of a belly laugh, as he grasps the hand of a visiting South Korean official. He sits at a wide conference table and beams as the envoys look on deferentially. He smiles broadly again at dinner, his wife at his side, the South Koreans seeming to hang on his every word. Kim is used to being the centre of gravity in a country that his family has ruled with unquestioned power since 1948, but the chance to play the senior statesman on the Korean Peninsula with a roomful of visiting South Koreans has afforded the autocratic leader a whole new raft of propaganda and political opportunities. He'll get another major chance to shine next month: Seoul says that Kim has agreed to hold a summit meeting -- the rivals' third-ever -- with South Korean President Moon Jae-in. The photos released by North Korean state media on Tuesday showing Kim meeting with Moon's envoys on Monday evening are all the more remarkable coming just months after a barrage of North Korean weapons tests and threats against Seoul and Washington had many fearing war. Kim can be seen in a North Korean TV video smiling and laughing, proposing a toast at the dinner reception, and waving as two limousines carrying the South Korean delegates left the main building of the ruling Workers' Party. The extraordinary images spread rapidly across the southern part of the peninsula a day after the North said Kim had an "openhearted talk" with 10 envoys for Moon. Kim reportedly expressed his desire to "write a new history of national reunification" during a dinner that the South Korean government said lasted about four hours. The meeting marked the first time South Korean officials have met with the young North Korean leader in person since he took power after his dictator father's death in late 2011. It's the latest sign that the Koreas are trying to mend ties after one of the tensest years in a region that seems to be permanently on edge. 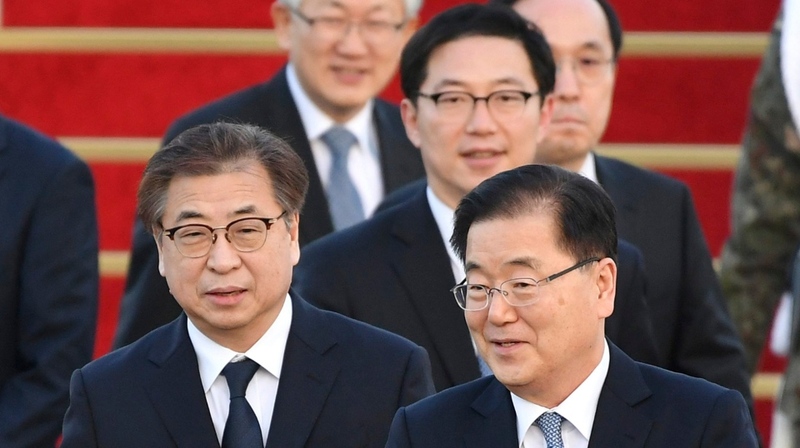 The South Korean delegation led by presidential national security director Chung Eui-yong returned to the South on Tuesday and announced the Kim-Moon summit planned for next month. Chung's trip was the first known high-level visit by South Korean officials to the North in about a decade. North Korea hasn't announced the summit agreement in its own media, more than a half-day after the South's announcement. Given the robust history of bloodshed, threats and animosity on the Korean Peninsula, there is considerable skepticism over whether the Koreas' apparent warming relations will lead to lasting peace. North Korea, some believe, is trying to use improved ties with the South to weaken U.S.-led international sanctions and pressure, and to provide domestic propaganda fodder for Kim. But each new development -- and especially a summit -- raises the possibility that the rivals can use the momentum from the good feelings created during North Korea's participation in the South's Pyeongchang Winter Olympics last month to ease a standoff over North Korea's nuclear ambitions and restart talks between the North and the United States. Seoul said the North also agreed during the talks to impose a moratorium on nuclear and missile tests if Pyongyang holds talks with Washington. The role of a confident leader welcoming visiting, and lower-ranking, officials from the rival South is one Kim clearly relishes. Smiling for cameras, he posed during the meeting with the South Koreans and presided over what was described by the North's official Korean Central News Agency as a "co-patriotic and sincere atmosphere." Many in Seoul and Washington will want to know if, the rhetoric and smiling images notwithstanding, there's any possibility Kim will negotiate over North Korea's breakneck pursuit of an arsenal of nuclear missiles that can viably target the U.S. mainland. Kim was said to have expressed at the dinner his "firm will to vigorously advance the north-south relations and write a new history of national reunification by the concerted efforts of our nation to be proud of in the world." There is speculation that better inter-Korean ties could pave the way for Washington and Pyongyang to talk about the North's nuclear weapons. The United States, however, has made clear that it doesn't want empty talks and that all options, including military measures, are on the table. Previous warming ties between the Koreas have come to nothing amid North Korea's repeated weapons tests and the North's claims that the annual U.S.-South Korean war games are a rehearsal for an invasion. Chung's delegation included intelligence chief Suh Hoon and Vice Unification Minister Chun Hae-sung. The South Korean presidential Blue House said the high-profile delegation was meant to reciprocate the Olympic trip by Kim Jong Un's sister, Kim Yo Jong, who became the first member of the North's ruling family to come to South Korea since the end of the 1950-53 Korean War. Kim Yo Jong, who also attended Monday's dinner, and other senior North Korean officials met with Moon during the Olympics, conveyed Kim Jong Un's invitation to visit Pyongyang and expressed their willingness to hold talks with the United States. Having concluded their Pyongyang trip, Chung's delegation is scheduled to fly to the United States to brief officials about the outcome of the talks with North Korean officials. President Donald Trump has said talks with North Korea will happen only "under the right conditions." He was still cautious, tweeting Tuesday's news was "possible progress." A summit next month would be the Koreas' third. The past two summits, one in 2000 and the other in 2007, were held between Kim's late father, Kim Jong Il, and two liberal South Korean presidents. They resulted in a series of co-operative projects between the Koreas that were scuttled during subsequent conservative administrations in the South. Associated Press writers Hyung-jin Kim and Kim Tong-hyung contributed to this report.